Heat the oven (with the oven rack in the middle) to 425°F. Break off and discard the stems at the base of the mushrooms. Using a damp paper towel, wipe off any visible dirt from the caps. Measure 2 tablespoons of the oil into a small bowl. 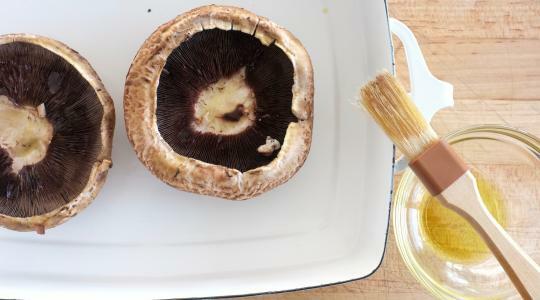 Using a pastry brush, brush both sides of the mushroom caps with the oil. Place them, stem-side up, in a baking dish and season with ⅛ teaspoon of the salt and ⅛ of the pepper. Roast until the mushrooms are tender and the centers can be easily pierced with the tip of a paring knife, about 25 minutes. 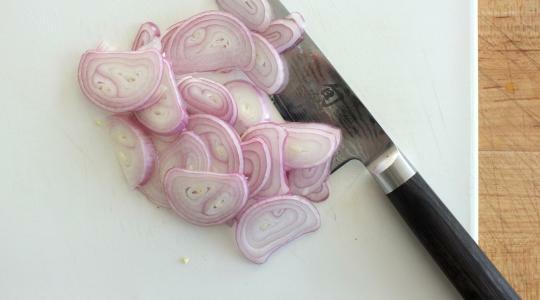 Thinly slice the shallots. In a large skillet, heat the remaining 2 tablespoons oil over medium-high heat. 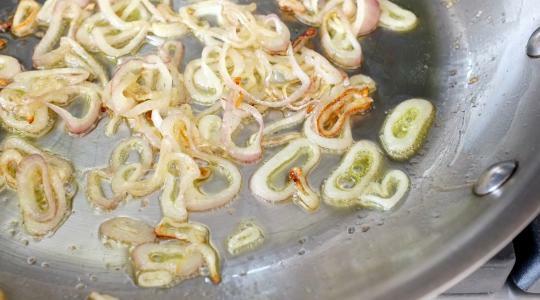 Add the shallots and cook, stirring often, until tender, about 3 minutes. 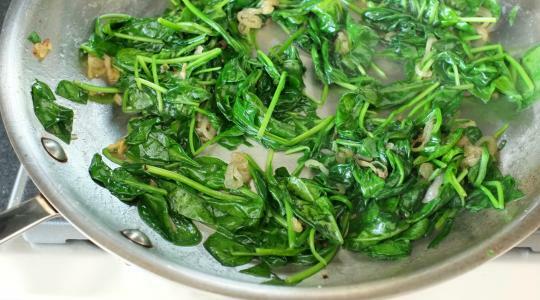 Add half of the spinach, cover tightly with a lid, and let wilt for about 1 minute. Add the remaining spinach, ⅛ teaspoon salt and ⅛ teaspoon pepper. Cook, stirring, until wilted, about 1 minute. 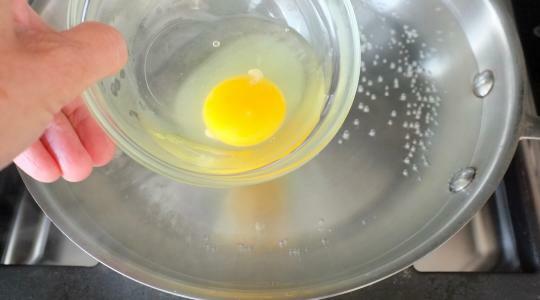 To poach the eggs, fill a medium saucepan ¾ full with water. Place over high heat and let come to a boil. Lower the heat to medium so the water simmers gently. Add the vinegar. One at a time, crack the eggs into a small bowl. Hold the bowl just over the surface of the water and let the egg slide in. Cook until the whites are set and the yolks still soft, 3 to 4 minutes. 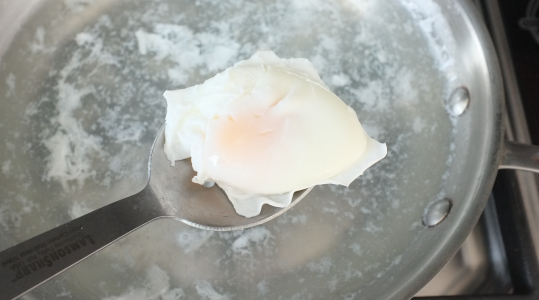 Use a slotted spoon to lift the eggs onto a paper towel-lined plate. 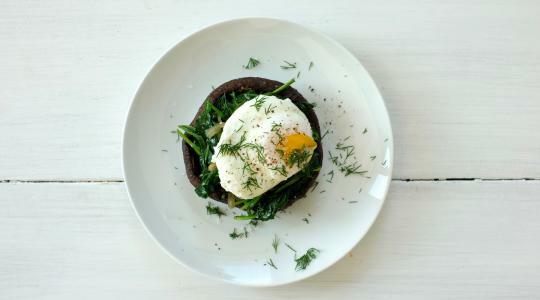 Fill the mushrooms with the spinach and top each with an egg. Sprinkle the dill over the tops and a little more salt and pepper.